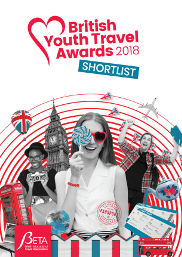 The awards help to gain recognition, and raise the profile of the work and individual successes of organisations engaged in youth, student and educational travel, to from and within the UK. These awards are co-ordinated by the British Educational Travel Association (BETA) and we are delighted to be able to reward and support the excellent work and high standards that our members and industry stakeholders demonstrate through their work year on year. From creating new and innovative products and programmes for young travellers, to outstanding examples of customer service and responding to the needs of these important individuals – individuals that collectively are worth over £22.3 billion to the UK economy each year. Having grown from a single category back in 2007, these awards have matured in stature and importance. For many these awards represent something special, something to work towards and this is demonstrated in the high quality of the entries received each year. Thank you to all those organisations that enter, sponsor and support this important industry event and to the judges that volunteer their time to individually score each of the entries in this competition. Check out the list of categories to see which one/s are for you. Once you have selected which award categories are applicable to you carefully study the entry criteria. Judges will score the entry out of ten on each of the set criteria elements. The easy to complete online official entry form is set out in such a way to enable to you respond fully to each criteria element and ensures that all entries are submitted in a standardised format. Self-nominate – blow your own trumpet and tell us how good you are! Make it snappy, make it flashy if you like, but be sure to address all of the points in the criteria document. To nominate, complete an Official Entry Form, entries will not be accepted if they are not on this form! Ready to submit! Once you have completed your official entry form, you are able to attach supporting evidence or send via post a small folder of items to support your entry. All forms and evidence must be received prior to the competition deadline or they will not be presented to the judges. And once you have done this, go ahead and do it all over again! You can enter more than once. Either select a different category or enter a different product or or campaign into the same category. The more the merrier! I am not a member of BETA , can I still enter? Yes this event is for all organisations in the youth, student and educational sector, not exclusive to BETA members. I have been awarded before – am I eligible to receive another award? Yes you can nominate every year. However organisations that have been successful in winning a particular category for three consecutive years will not be permitted to enter. A period of 12 months must pass before that organisation is eligible to enter again. How do I get into the Hall of Fame? If I meet all of the criteria, will I definitely get an award? If you meet all of the criteria, your nomination will be submitted to our panel of judges who will score each application and select a winner in each category. Can I submit for more than one award? Yes you can nominate for as many categories as you wish. Please ensure you complete an Official Entry form for each category. When is the awards Nominations deadline? All submissions must be received by 5pm on 26th October 2018.
Who can vote for the Best Youth Destination Award? How are the winners of each award determined? The panel of judges will meet in person to review each submission and supporting evidence and rate the successfulness of each criteria point out of 10. The shortlisted nominations will be announced in mid November with the winners being announced at a glittering ceremony in Central London on Thursday 29th November 2018. When will the short-list be announced? The shortlisted nominees in each category (with the exception of Outstanding Achievement) will be announced in Mid November. The winners in each category will be announced at the BYTA Awards Ceremony on Thursday 29th November 2018 in London. When and where will the Award ceremony take place? Business / formal / festive / we’ll leave it to you to make sure you look great! Can I book tickets for the award ceremony even if I have not entered? You certainly can, we look forward to welcoming many industry professionals to celebrate with us. Tickets are prices at £59 + VAT per delegate for BETA Members and £75 + VAT per delegate for Non-Members. Click here for further details on the ceremony and to book tickets now.